The ligaments of the ankle hold the ankle bones and joint in position. They protect the ankle joint from abnormal movements — especially twisting, turning, and rolling of the foot. A ligament is an elastic structure. Ligaments usually stretch within their limits and then go back to their normal positions. When a ligament is forced to stretch beyond its normal range, an ankle sprain occurs. A severe ankle sprain causes actual tearing of the elastic fibers. The amount of force determines the grade of the sprain. A mild sprain is a Grade 1. A moderate sprain is a Grade 2. A severe strain is a Grade 3 (see Table below). Grade 1 sprain: Slight stretching and some damage to the fibers (fibrils) of the ligament. Grade 2 sprain: Partial tearing of the ligament. If the ankle joint is examined and moved in certain ways, abnormal looseness (laxity) of the ankle joint occurs. Grade 3 sprain: Complete tear of the ligament. 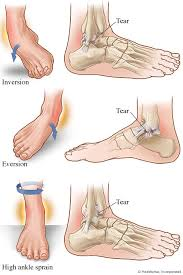 If the examiner pulls or pushes on the ankle joint in certain movements, gross instability occurs. It is very important to get treatment to a sprained ankle to decrease pain, inflammation, and prevent lasting effects.